Ladies and gentlemen, introducing Pikachu Stump, lead singer of Fall Out Boy. I don’t know if I’ve ever felt worse for pre-judging a video game before release than I have for nonchalantly dismissing Pokémon: Let’s Go Pikachu and Let’s Go Eevee out of hand when they were revealed earlier this year. To be fair, with the information I possessed at the time, it was hard not to be somewhat skeptical. My relationship with Pokémon Go was tenuous at best – I found it difficult to understand the phenomenon when it launched back in 2016 thanks in large part to the fact that I found it to be a buggy, unstable, bare-bones mess of a game with few redeeming qualities. Early experiences scouring my neighborhood for Pokémon often ended in the game freezing, stubbornly refusing to load, or crashing entirely. When it did work, Pokémon Go seemed to decide when the player was close enough to engage a Pokémon based on arbitrary metrics that often made no sense to me. These early-day experiences (combined with my phone’s touchscreen malfunctioning due to unrelated water damage) turned me off of Pokémon Go. After all, why bother with an early-days mobile game suffering from a feature deficit when I can enjoy far better, deeper experiences centered around the same core concept on my 3DS? When the Let’s Go games were announced this past May, I was simultaneously disappointed and incredibly skeptical. Ever since the Switch launched, one of the upcoming projects I had been most excited to see come to fruition was a core Pokémon RPG on the platform. To Nintendo and the Pokémon Company’s credit, that game has been announced, and is due out sometime in 2019. But the notion that the first Pokémon games on Switch that would bear any resemblance to the console games I had imagined in my head for so long would be dumbed-down spinoff titles centered around Pokémon Go’s capture mechanics saddened me. Let’s Go Pikachu and Eevee (for the past few days, I’ve been playing Pikachu) are, in my opinion, the ultimate culmination of the promise of Pokémon Go. The team at Game Freak has succeeded in marrying the sole part of Pokémon Go that worked for me (capturing Pokémon) with the simplified JRPG elements of your average Pokémon game. In the process, they’ve delivered a stirring love letter to the first generation of Pokémon that reimagines the original 1996 adventures while keeping them pure in essence. Why are there Blaine dolls everywhere? Play, and find out. There are concessions made in the name of streamlining your adventure – the games are nearly 1:1 adaptations of 1998’s Pokémon Yellow, meaning that popular features introduced later in the series such as breeding and the existence of passive abilities specific to each Pokémon won’t be found here. Additionally, several quality-of-life changes have been made to the games in order to render certain aspects of their play less frustrating in 2018. 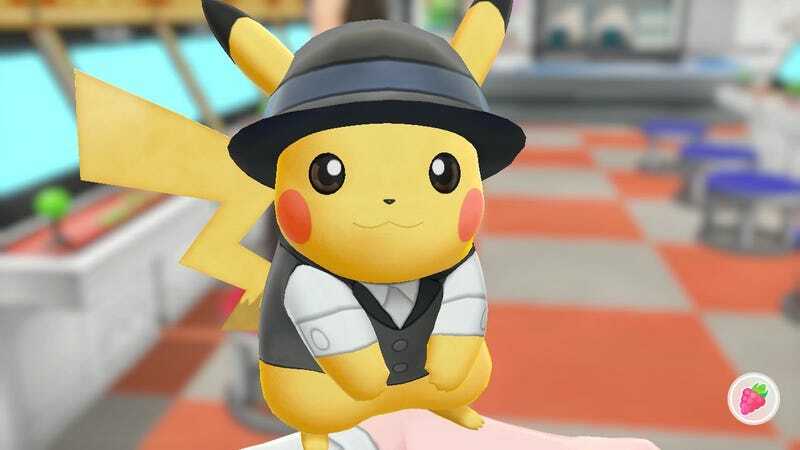 · What is undoubtedly the Let’s Go titles’ most universally welcome addition: the decision to render your Pokémon Box accessible at all times, allowing the player to swap out Pokémon in their party at will rather than needing to be at a PC in a nearby town. All of these changes in Let’s Go, for the most part, go a long way towards making the original Pokémon Yellow campaign feel acceptably welcoming to newcomers in 2018 without sacrificing the overall spirit of the original games. The narrative of that campaign, save for a few small, yet significant changes, is largely the same as it was in the original game: you are a ten-year old Pokémon Trainer who leaves their home of Pallet Town to quest across the continent of Kanto in pursuit of eight gym badges that will allow them access to the Indigo Plateau, where they can compete for the title of the champion of Kanto’s Pokémon League. Along the way, you’ll run afoul of Team Rocket, a nefarious criminal organization that exploits Pokémon for their own malicious purposes, and will soon become the sole thing standing between their leader, Giovanni, and the culmination of his goals. Jessie and James are here too... and as incompetent as ever. This plot structure will sound familiar to anyone who’s played… well, any Pokémon game released within the last twenty-two years, but there’s something charming about seeing the journey that started it all rendered with console-quality visuals for the first time in franchise history. I’ve had a multitude of friends whose bitterness towards Let’s Go stems from the fact that they’re Kanto remakes, furthering the Gen 1 nostalgia that permeates so much of the Pokémon fanbase. This is a valid concern. However, despite the fact that I knew basically all of the narrative beats, this adventure was still new enough to feel fresh to me, thanks in large part to the upgrade in quality, some of the additions I listed above, and, most of all, one that I didn’t – one that is likely going to go down in history as the most divisive change Game Freak has made to Pokémon’s formula in some time. A nigh-perfect fusion of mechanics. Random encounters need to go the way of the dinosaur. Let’s Go Pikachu and Eevee are the first Pokémon RPGs where you can see wild Pokémon floating around in the overworld before you catch them, replacing the need to wander into tall grass or dark caves, blindly searching for local Pokémon. This removes a certain element of surprise when it comes to wild Pokémon encounters, given that you’ll always know what it is you’re likely to catch when you choose to confront and capture a creature. However, random encounters as they’ve existed previously in Pokémon games have, especially during late-game travel, often served as frustrating ways to slow the player’s progression through the main plotline. Pidgey are still everywhere... but it shall no longer surprise you. Too often in previous games have I wandered through a nondescript cave only to be surprised with the coming of the umpteenth Zubat to cross my path within the span of ten minutes. Sailing across the ocean seas becomes far more frustrating when three or four Tentacool spawn in between each individual trainer encounter. Furthermore, these encounters become even more frustrating when there’s a specific Pokémon you’re looking for – searching for a Pikachu in Viridian Forest was much less fun in the days of the original games, when one would often run up against dozens of Caterpie and Weedle for hours before they’d ever see the series’ core mascot. Having Pokémon float around in the overworld is a marked improvement for a few reasons: first, it allows the world to feel much more vibrant, overcoming the static nature of tall grass and still oceans as they existed in previous games. The notion that a fully-animated, roving Pokémon could spawn before your eyes at any given moment adds a layer of excitement to traveling from town to town. It’s even more thrilling when it’s a Pokémon you’ve never seen before, providing active incentive for you to stick around the route you’re on and make sure that you add it to your collection. In short, it makes the actual experience of catching them all enjoyable in a way that it hasn’t been in years. If, in the next few core titles, they kept the same method of Pokémon discovery while returning to the concept of wild Pokémon battles during actual confrontations, it would be the best of both worlds. There’s a lot more I could say about Pokémon: Let’s Go, Pikachu and Eevee. I could go on for ages about the way the new titles reimagine iconic characters from the original games, or the cinematic flourishes added to some of the first generation’s defining moments. But for now, I’ll just say that I pre-judged this game too harshly – it’s become one of my favorites of the year, and I look forward to seeing where Game Freak takes this concept next.